﻿ Irish Film Institute -WIN A 2001: A SPACE ODYSSEY POSTER & BOOK! WIN A 2001: A SPACE ODYSSEY POSTER & BOOK! Celebrating the re-release of the newly restored, 2001: A Space Odyssey, opening Friday, November 28th at the IFI, we have a film poster and a copy of the BFI film classics book, 2001: Space Odyssey courtesy of our friends at the British Film Institute to give away to one lucky winner! 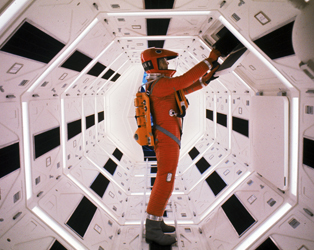 Newly restored and digitally re-released, Stanley Kubrick’s iconic 2001: A Space Odyssey, written in collaboration with Arthur C. Clarke, has come to occupy a unique place in popular culture, its elements part of our shared lexicon, whether it be its association with particular pieces of music (Richard Strauss’ Also Sprach Zarathustra, for example), or arguably the most famous match cut in cinematic history, or the voice of the rational but deadly HAL 9000. However, Kubrick’s film is so much more than these isolated moments; its grand scale covers the history of human evolution, posing insightful questions about who we are, why we behave as we do, and where our species might go from here. Kubrick presents future wonders as habitual, banal, but the real wonder is in his making such abstract concepts so relatable, and so beautiful. In what year was 2001: A Space Odyssey released?